All my X1 Blade structural designs are tailored to specific applications (sesamoiditis being one) using a combination of mediums: composites (carbon fibers both bidirectional and unidirectional and glass), a unique low coefficient of friction film, and compression resistant polyethalene foams. 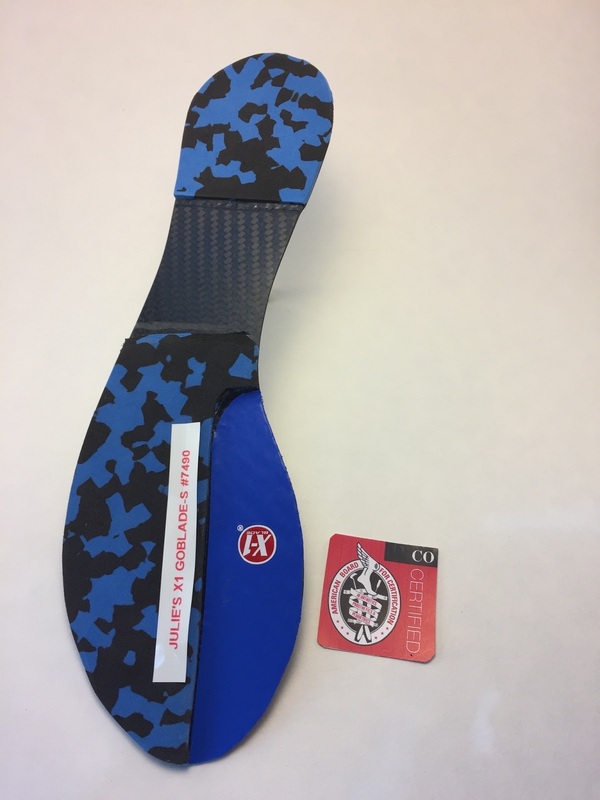 Unlike a "carbon fiber plate" that is uniform in density and stiffness (like a rigid dinner plate) the X1 Blade orthotic varies in density and flexibilty. We achieve this by varying the fiber orientations along the laminate structure in three zones - rear, mid, and forefoot. This variable design allows for a more natural foot motion. not to restrict ankle motion during activity 3) Forefoot - stiff minus with a 2mm drop under great toe lined with low friction film (ShearBan). 2) Rocker Shape to encourage a more natural gait and fit the curvature of a standard shoe shape. A flat "carbon fiber plate" is only good for children who are toe-walkers. It will to get them into a more natural heel toe toe gait. 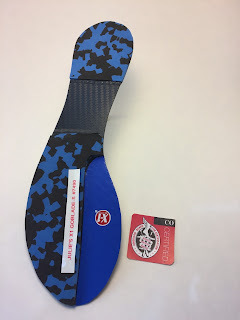 As you have found it is very difficult to walk normally with a stiff flat "carbon fiber plate" in your shoe. There is a biomechanical reason for that! 3) Medial Toe Wedge - The 2mm drop under the great toe creates a 1mm medial wedge that shifts some of the ground force off the 1st MTP (sesamoids) to the 2 through 5 met heads during weight-bearing. 4) 2mm poyethalene foam (compression resistant) - added to forefoot zone to shift more ground force from 1st MTP to mets 2 through 5. 5) Specs: Weight: Usually 1+ ounce depending on the shoe size. Thinness: from 1mm to 2mm in thinness depending on the flexibility zone. The shoe issue. What I say is: if you decide to order an X1 Blade for your sesamoiditis when you get it try it without an insert in the shoe to see if it will work for you and if so deal with the shoe issue last. Patrick, I have made several of these X1 Blades for sesamoiditis (usually for athletes) with a 100% money back satisfaction guarantee, and so far I have never gotten one back. So I would say give it a try!